Individually, the words mini, no bake, goat cheese, and cheesecake all appeal to me. Plus cherries?? Put those all together and I’m a goner. 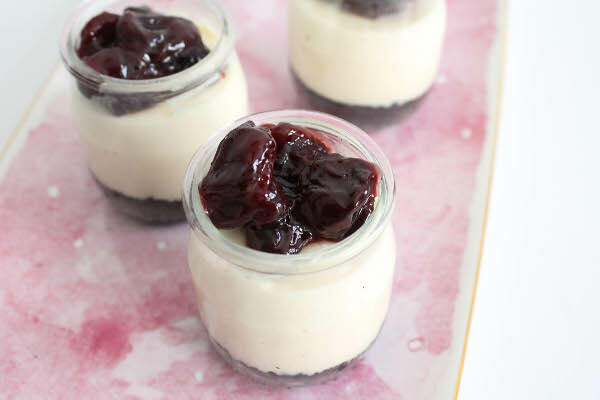 I made little individual goat cheese cheesecakes with a chocolate crust, and topped them with roasted cherries (which you do need to bake, but you can make this ahead of time, or you can use a stovetop, or you can even substitute cherry jam). 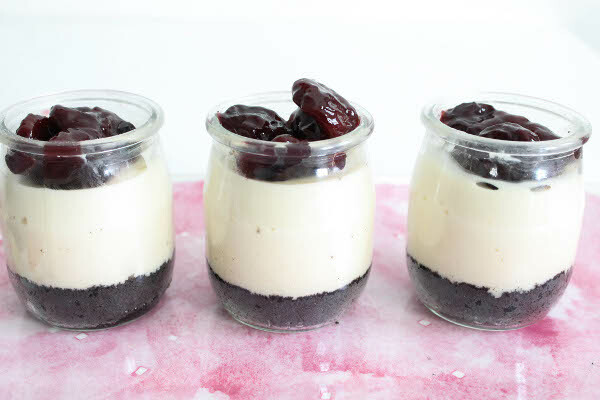 Each cold, creamy bite has a little tang from the goat cheese, a little crunch from the chocolate cookie crust, and a burst of deep sweetness from the roasted red cherries. The inspiration for the flavors come from my favorite Jeni’s Ice Cream: goat cheese with red cherries. I love treating myself to a scoop, but it is a pretty expensive habit (each pint costs $12). Every time I eat it, I think to myself, “this tastes just like a frozen cheesecake” until finally I decided to just make cheesecake myself. I made a chocolate crust using Famous Chocolate Wafers (I’ve used this before for cheesecake and I like the dark chocolate flavor) but if you can’t find those cookies in your grocery store, crushed up Oreos would work nicely, too. And so would a regular graham cracker crust. I actually almost bought a pack of Oreo Chocolate Berry Burst but decided against it – I knew I wouldn’t end up using the entire package, which means that there’ll be lots of strawberry cream-filled Oreos that will probably just go stale in my cupboard… Or not. Someone please invite me to a picnic or a children’s party where I can have an excuse to buy pink cream Oreos. Please? Back to these cheesecakes. I ended up with eight individual servings, using little glass jars I’ve collected over the years – a yogurt jar from Paris, a rice pudding jar from Madrid, a couple of little mason jars that I keep in my cupboards, plus a few more yogurt jars from Whole Foods (the brand I like is Trader’s Point Creamery). The jars average out to about 5 oz each, and I have to say that they are all so darn cute! These little cheesecakes are perfect for dinner parties, picnics, or Sunday night get-togethers with friends to watch Game of Thrones. And if your friends can’t make it and it’s just you, guess what, you can easily grab one of these adorable jars from your freezer as you tune in to HBO and try not to think about how badly you want a baby dragon as a pet. Make the crust. Mix chocolate wafer crumbs and butter in a medium bowl. Transfer crumb mixture to individual jars and press evenly onto bottom using the back of a spoon. Refrigerate while making filling. Make the cheesecake filling. Combine goat cheese and cream cheese and beat together until smooth. Add condensed milk in four increments, mixing thoroughly and scraping sides of bowl as necessary. Fold in lemon zest and vanilla. Pour filling into jars and refrigerate for at least 4 hours, or freeze for at least 2 hours. Make the roasted cherries. Preheat oven to 400 F. Combine frozen cherries, sugar, and flour in a foil-lined baking dish, tossing together to mix (the foil makes for easy clean-up). Roast for 45 minutes, until sauce is thick and bubbly, stirring every 15 minutes. Cool completely and store in the refrigerator until ready to use. Before serving, spoon over roasted cherries on top of each cheesecake. This recipe would also work for one big cheesecake (using a 9-inch spring-form pan). The roasted cherries really add a different depth of flavor to the sweet and tangy cheesecake. You can use fresh cherries instead of frozen, but I have no patience to take out the pits so I just buy frozen cherries from Whole Foods. I like storing the cheesecake in the freezer, and it really does remind me of ice cream because it’s not as dense as baked cheesecake. Well, it’s like ice cream, but a lot cuter. Have you ever had goat cheese cheesecake or Jeni’s ice cream? What’s your favorite? i have never had Jeni’s icecream but loveee goat cheese. i hardly make cheese cake but in the form of mini dessert. i have yet to watch season premiere of Game of Thrones..yes yes yes to baby dragon. I have never used goat cheese in desserts before but will give it a try. That looks so inviting. Thank you! 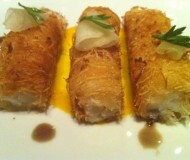 I was surprised by how much I liked goat cheese in desserts, and I hope you would like it too! You are right, we both do love the mini no-bake desserts:-) I love the idea of a cheesecake that tastes like ice cream and vice versa. Also love the mix of different little jars for serving! Yes, the cute factor is an added bonus! I love Jeni’s ice cream, goat cheese cheesecake and pretty much everything about this recipe. I love your collection of little jars! Goat cheese cheesecake is so good. I need to try some Jeni’s! 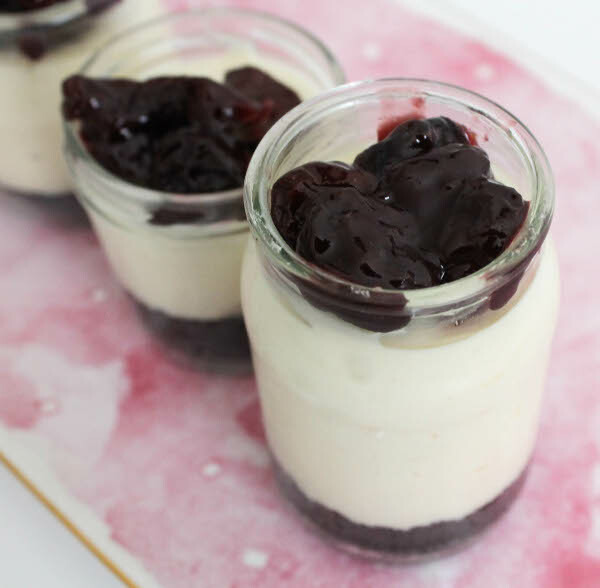 I love these individual sized desserts – and cherries are always a favorite – and cheesecake and goat cheese – this is a home run and so pretty! I should have eaten lunch before visiting – now I’m drooling! I love how you reused the glass jars! And we also watch Game of Thrones…a fun snack like this makes the “viewing party” that much more fun! Oh wow, goat cheese and cherry cheesecake! This sounds fantastic. What is the consistency of the cheesecake like? Is it firm? Love these! I bet this tastes divine. Pinning! Thank you, Norma! Happy Friday! I love everything about these, Bianca! 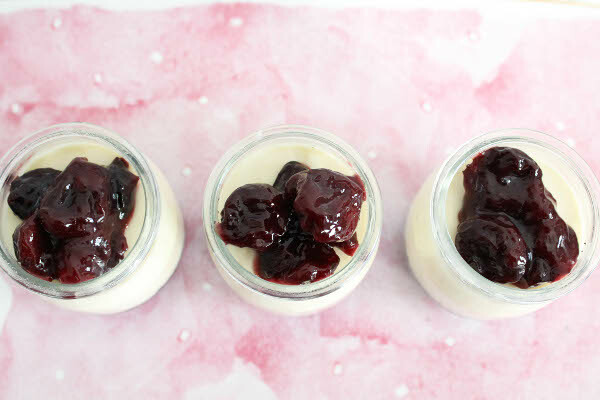 The roasted cherries, goat cheese and the fact that they are no-bake make these the perfect little dessert! This is such a cute and elegant dessert. i love goat cheese but never had it in a dessert. I just bought goat cheese today and love the flavour. I can so see this tasting absolutely delicious! LOVE the roasted cherries idea. These are so cute and what a great idea! I love goat cheese..
Hehe, I totally agree with you about all those words being appealing! Man, these look SO GOOD. I bet the tartness of goat cheese balances out the richness of cheesecake perfectly. Yumm!!!!! I love me some no bake treats so I’m totally all over these cheesecake beauties! Thanks Pamela! Assembling the cheesecakes were so easy I almost felt like I was cheating haha. I hope you get to try them soon! 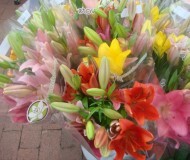 Thank you, Juliana! Have a great weekend! Wow – great idea Bianca. We love how you create this from an inspiration of the flavors in an ice cream. We love doing the same thing- makes it much more fun!! Heehee yes just because they are portion-controlled doesn’t mean it’s easy to stop at one! I am totally flipping out over these!! 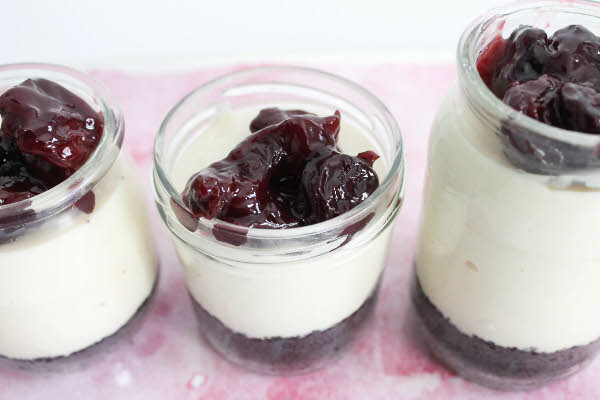 I love goat cheese in dessert, the roasted cherry sound ridiculously awesome, in the story about where you got your different Mason jars is just too cool. Thanks, Erin :) I am running out of storage space for all my random jars, but they’re all so cute I don’t want to part with any! What an exquisite dessert!!! And thanks for the permission to use frozen cherries….LOVE that idea!!! Wow. Roasted cherries? I didn’t know that that was a thing! This looks SO good! These remind me of the cheesecake cups at Tatte—so pretty and cute. I love the flavor combination here and your collected jars are so sweet. Cheesecake is great (or dangerous) when you’re cooking solo like I am—it lasts a good while, which means I could eat on every night :). Ahh the Tatte cheesecakes are so good! Coincidentally, that is where I first discovered Jeni’s ice cream :) One little scoop is $4! Eeep. I love cheesecake as is, but smother it in cherries?! Swooning. I would happily eat one (or eight) or these! Goat cheese cheesecake?? That sounds amazing! I keep meaning to try roasting cherries – they look so darn good. Hope you had a great weekend! i have very strong mixed feelings about goat cheese. sometimes i like it, sometimes it’s just terrible. this sounds like a version i would like, especially with those luscious cherries. These sound lovely (and look great too)! I am a huge fan of cherries, so I’d love to dive right into one of these little pots! I love that you’ve collected these glass jars from all your travels! What a beautiful dessert! These seriously look amazing! Love every single word in that title! Great recipe! 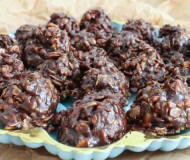 I made this today and the flavors are great, but the filling came out almost yogurt-like. Is that what this recipe is going for or did I maybe not whip it together long enough?